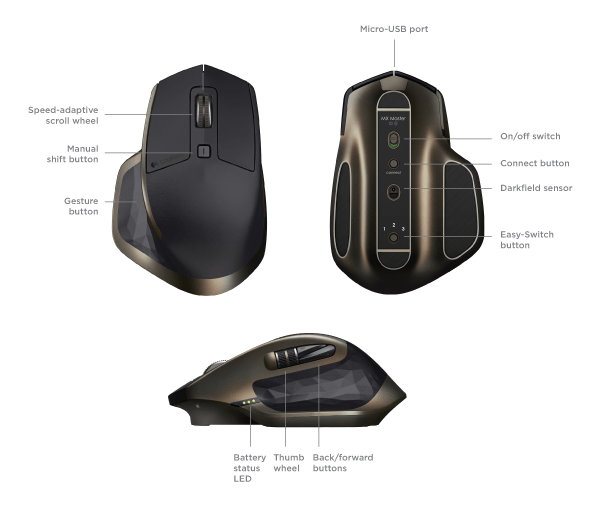 I’m not a huge fan of wireless mice, mostly due to the input lag and getting caught out with flat batteries, the MX Master has given me a few reasons for me to try it out. One important feature that has tempted me is the ability to support up to three devices. The shape and styling are another few reasons. The connection options are either Bluetooth, or the included Logitech Unifying receiver. The online documentation is very good at explaining how to set up the mouse on the separate devices and switch between them. The speed-adaptive scroll wheel is a great improvement. For those of you who have the previous Logitech mice that allow you to switch between a stepping or freewheeling mouse wheel, this is a middle ground between both. if you are say scrolling through a document slowly you will feel the stepping in the mouse wheel. If you want to zip to the bottom of the document and like many use the scroll wheel and try to flick the scroll wheel it will become free wheeling. The button behind the scroll wheel allows you to set the mode of the scroll wheel: hybrid or free wheeling. The next interesting feature is the Gesture button. which is located on the thumb rest, it is not noticeable and you do need to press with a reasonable amount of force. By default, it is configured for windows management (Alt + Tab). If you install the Logitech Options Software you can re-configure it to a number of different things: Mode shift, Switch applications, back, calculator, close window, copy, paste, double click and the list goes on. Similarly, the thumb scroll can also be configured via the software to do a number of different things. I have set mine to be previous and next tab, this is a good way to flip through all those tabs I have open at once. The thumb scroll does seem stiff to turn but makes up for that by being in just the right spot to use every time without having to reach for it. The backwards and forwards buttons do suffer, as their placement and arrangement are not very standard. I found it strange and uncomfortable at first. Thankfully it won't take long to train yourself to use them, especially if this is going to become your daily driver. The Options Software allows you to change just about everything except the left and right click, you can swap the left and right click and that's about it. Annoyingly the batter is built in and cannot be swapped out, you do get a USB to Micro-USB cable to charge the mouse.